Essentially a quick, easy coffeecake, this dessert was adapted from a recipe in the September 2007 issue of Martha Stewart Living. Preheat the oven to 375 degrees. Butter one 8-by-10-inch baking pan, or one 9-inch round pan. In a medium-size bowl, whisk together the flour, baking powder, and salt. In a separate bowl, combine the egg, sugar, milk, and oil; whisk until smooth. Fold the wet mixture into the flour mixture and stir until just blended. Spoon the batter into the prepared pan and smooth out the top. 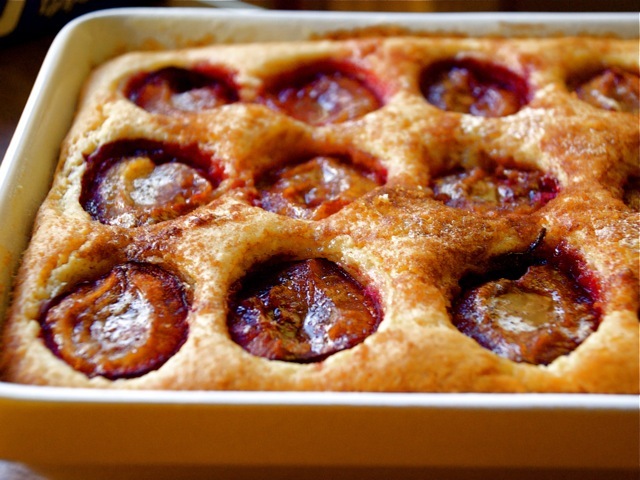 Arrange the plum halves, cut sides up, atop batter. Combine the brown sugar and cinnamon, then sprinkle the mixture over the plums. Dot with the tablespoon of butter. Bake until the top of the cake is golden, the plums are soft, and a toothpick inserted into the center of the cake comes out clean, about 35 to 40 minutes. Cool slightly before serving.